Tonight’s UFC Wichita event was headlined by a key heavyweight fight featuring Derrick Lewis taking on former title holder Junior dos Santos. Lewis entered tonight’s contest looking to rebound, this after being submitted by current UFC heavyweight champ Daniel Cormier in his most recent effort at UFC 230. Prior to the setback, “The Black Beast” had put together a three-fight win streak over opponents Marcin Tybura, Francis Ngannou and Alexander Volkov. As for former UFC heavyweight champion Junior dos Santos, the Brazilian standout entered tonight’s UFC Wichita main event on the heels of a second round TKO victory over Tai Tuivasa which occurred this past December in Adelaide. Tonight’s UFC Wichita main was a back and forth affair, with both men landing big punches and kicks in the early minutes of the fight. Late in round one, “JDS” was able to catch Lewis with spinning back kick which had Derrick in all sorts of pain and covering up. Somehow Lewis survived Junior’s onslaught and we moved on to round. In the second round Junior dos Santos clipped Derrick Lewis with a huge right. The former heavyweight world champion followed up with some more strikes which eventually caused “The Black Beast” to hit the canvas. From there, Junior would deliver some ground and pound which forced the referee to stop in and stop the contest. 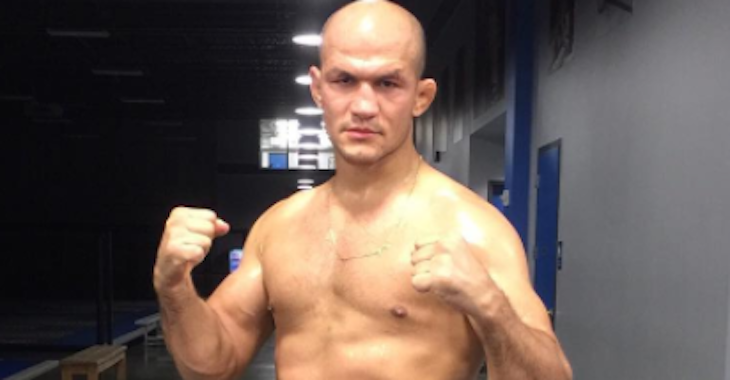 Check out how the pros reacted to Junior dos Santos defeating Derrick Lewis at UFC Wichita below. Best heavyweight fight I’ve seen in a minute! Obviously impressed with Dos Santos but also Lewis’s determination, thought he was rope-a-doping when he was actually hurt, nuts! What was your reaction to the finish in tonight’s UFC Wichita main event between Junior dos Santos and Derrick Lewis? Sound off in the comments section PENN Nation!